Hex and Binary Code Data Editing Software Utility for Windows. Hex Editor Neo is a basic editor for everyone who works with ASCII, hex, decimal, float, double and binary data. Make patches with just two mouse clicks, manipulate your EXE, DLL, DAT, AVI, MP3, JPG files with unlimited undo/redo. Taste the visual operation history with branching. Changes history can be saved, loaded and modified later. Large files optimized, best performance tool. 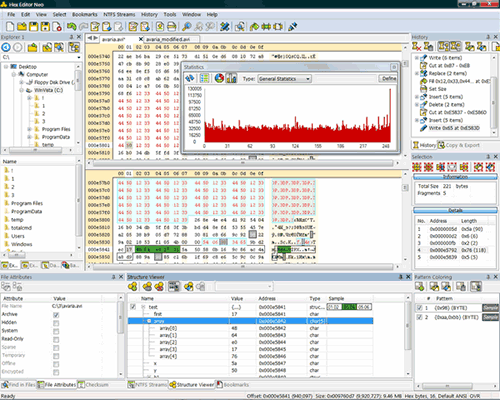 Features: Unlimited Undo/Redo; Multiple Selection; Selection Save and Load; Find; Replace; Find and Replace in Files; History Save and Load; Patch Creation; Clipboard Operations; Bytes, Words, Double Words, Quad Words, Floats and Doubles Edit Mode; Pattern Coloring; Data Inspector; Bookmarks; Structure Viewer; Statistic; Base Converter; Scripting. Hex Editor Download.